Travel to the exotic Middle East and savor the luxurious accommodations found at the Shangri-La Hotel Qaryat Al Beri in Abu Dhabi; book your travel across WhataHotel! and receive Exclusive Complimentary Perks for a fantastic deal. 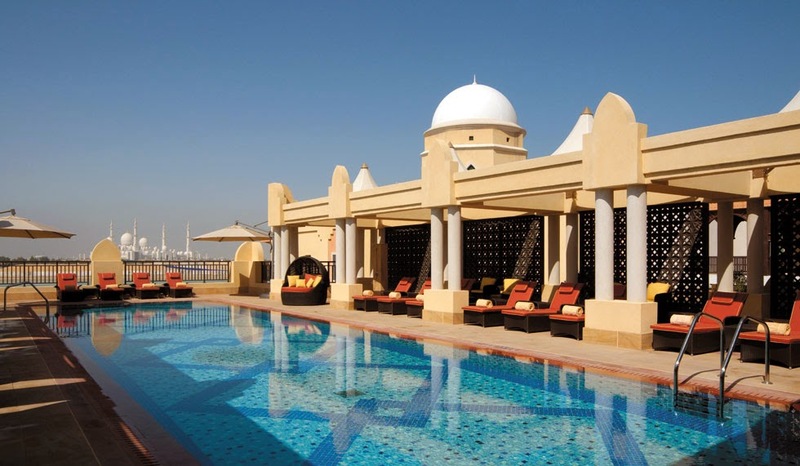 This elegant hotel is situated on one-kilometer of private beach overlooking the straight that separates the mainland from the beautiful Abu Dhabi Island. 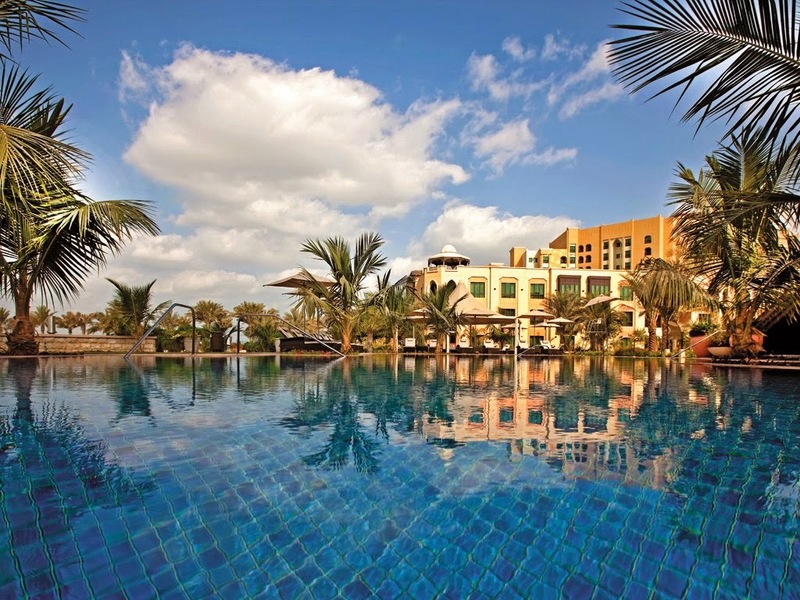 With just a 10 minute drive to the international airport, a 15 minute drive to Corniche and the city center and 5 minutes from the fantastic golf course, the Shangri-La Hotel Qaryat Al Beri is conveniently located to ensure relaxation and adventure. Realize the grandeur and glamour that attracts people from all over the world to visit this ultra-chic travel destination. Shangri-La Hotel Qaryat Al Beri is a relaxed and fashionable locale that presents guests with traditional Arabic touches for an authentic stay. Guests arrive to find impressive architecture, culturally significant decor with warm earthy tones. The hotel grounds are large and connected via a winding waterway. Arabian boats called abras travel through the waterways giving guests a relaxing tour of the property and gardens. They eventually drop you off at the hotel's souk which is a traditional market. Here you can shop for artifacts, jewelry, clothing and home goods. Nearby the market is the private beach that is the perfect place to lounge while enjoying the warm ocean air or watch the sun drift below the water's edge. 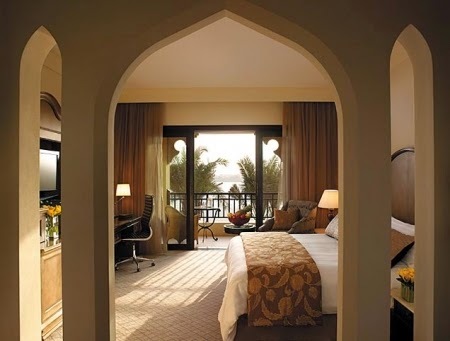 The 214 well-appointed guestrooms and suites at Shangri-La Hotel Qaryat Al Beri are simply decadent. They boast either a balcony or terrace with picturesque views of the canal, modern facilities, and comfortable furnishings. There are also six four-bedroom villas that each have a private pool for those requiring a bit more space and of course the 161 well-serviced apartments that cater to guests that plan to stay in this stunning city a bit longer. Other amazing amenities include the modern fitness center, the two fantastic swimming pools, a wide variety of fun activities and the calm and secluded beach. Guests can also book a treatment at The Spa at Shangri-La that utilizes ancient healing philosophies in many of the services for a relaxing time. Dining at Shangri-La Hotel Qaryat Al Beri will tantalize your taste-buds, it is the home of some of Abu Dhabi's finest restaurants. Enjoy both international cuisine as well as authentic Chinese meals, sensational French food , and delightful Vietnamese cuisine from the award-winning restaurant Hoi An. 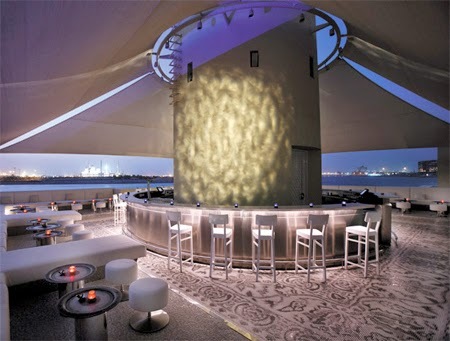 Cocktails and wine can be found at Hanah Bar and Pearls Bar or check out the informal Lobby Lounge and Pool Bar for a casual drink or light meal. 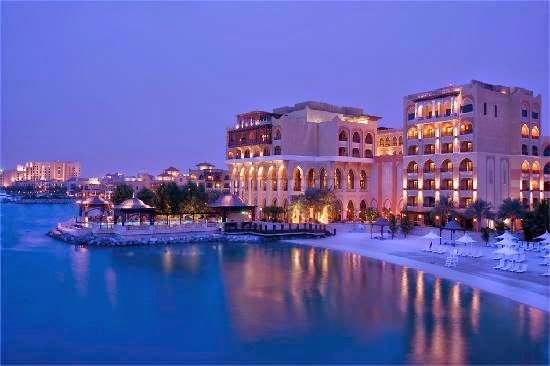 Shangri-La Hotel Qaryat Al Beri has something for everyone in a city filled with style. When booking your travel to Shangri-La Hotel Qaryat Al Beri across WhataHotel!, guests can enjoy Exclusive Complimentary Perks for an unbeatable deal. These perks include available upgrades and time of check-in, a buffet breakfast for two daily, a lovely welcome amenity, a spa credit and options for early check-in and late check-out. Revel in the beauty and cultural charm of the Middle East while experiencing limitless luxury and impeccable service at this always extraordinary Shangri-La Hotel Qaryat Al Beri.